Do you use attention grabbers or class call backs? They are a MUST HAVE in my opinion. However I truly LOATHE “class class, yes yes”. And sometimes you want to change it up from the clapping pattern repeat. So I have some fun alternatives. I leave them out so that any of our classroom visitors know what “works” with my kiddos. If you’ve never used class call backs before – it’s super simple. You say the first part to grab the students’ attention, they reply with the second part. So, you’d say . . .
and the kiddos would stop what they were doing (and their talking!) and answer . . .
You can grab this FREEBIE in my store! You are ADORABLE. I love these attention getters…and use them all the time, but now I have them in cute form! Also just got your Leap Into a Good Book….can I possibly get it together for Leap Day??? Thanks for the attention grabbers — I got some new ones! Love the attention grabbers! It is put together in such a cute way! 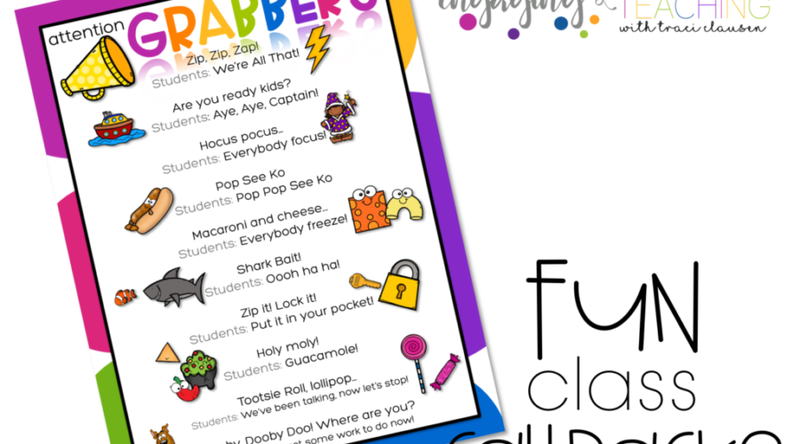 these attention grabbers are perfect for prek! i can't wait to teach them to my little ones in the fall! What font did you use for the attention grabbers?! Very cute! I can't wait to use this!! So excited! Love it!!! Thanks for making it free too! You are the best!!! LOVE your attention grabbers! I featured them on my blog today here. Thanks!! I just found your cute blog through 3rd grade thoughts. I'm totally using your attention grabbers. Thank you! They're all so fun. I teach first too. Love the attention grabber poster. Thank you for the FREEBIE! I can't wait to use it on Monday… the kiddos are going to get a kick out of it! Thank you !!! This will be great in my classroom! You'd be surprised how far those attention grabbers can go!! Just got myself a copy for my sixth graders. At that age, the sillier, the better! Feel free to stop by http://www.yoursmarticles.blogspot.com for tech tips, freebies and more! !